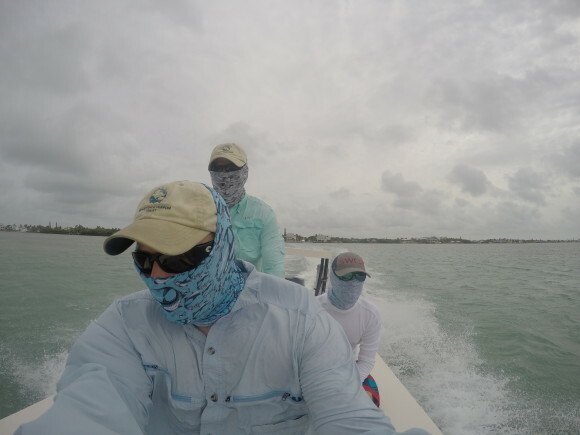 This video kills me… that big, nasty, beautiful, wonderful school of good sized tarpon and the shot goes begging… which is pretty much true to form. 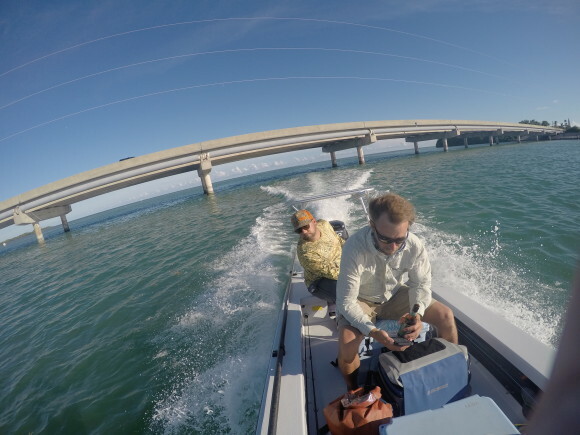 Yeah, I’m thinking about tarpon and about next May when I’m going to make it back to Florida and back down to the Keys for a few days of tarponing, which is to say a few days of dodging storms and failing to see fish and fishing hard and maybe, if I’m lucky, getting a follow. Tarpon are just cool. No way around it. 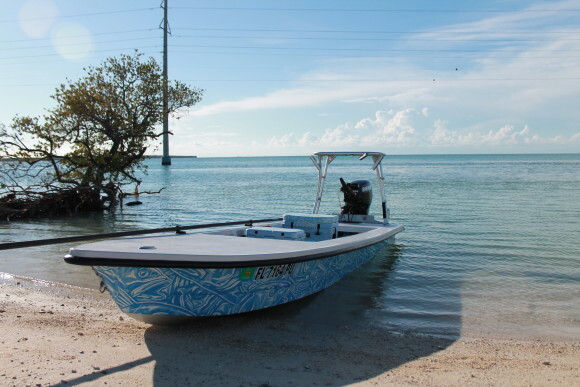 When I was on that Florida tarpon hunt I had the distinct pleasure of riding around part of the week in the best looking boat on the water. If you’ve been out in the Glades or around Miami, you might have seen it. I’m talking about Eric Estrada’s Ankona. That is a good looking boat. Each boat is built for a purpose and this is built for the backwaters, the skinny stuff. We tried to make this into an ocean-side tarpon boat, but a little water over the gunnels and we thought better of it. It is a thing of beauty. The art, Eric’s original art, is a wrap around the hull, so it can be changed, but I just love the look of it. Day 5 was ugly. The wind was up in a big way and ruled out most of what we would have wanted to do. I was fishing with Bill Horn, the guy who wrote the (or at least a) book about the Keys. 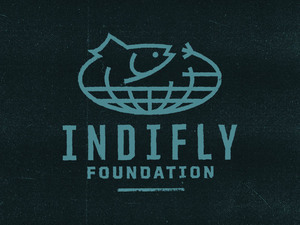 He’s also on the Board for the Bonefish and Tarpon Trust. Also in the boat was Dan Dow, who works at BTT. It is always good to be in the boat with Bill. He has his home waters dialed and managed a couple of wizard-like moments in conditions that were beyond rough. We were taking green rollers over the bow. 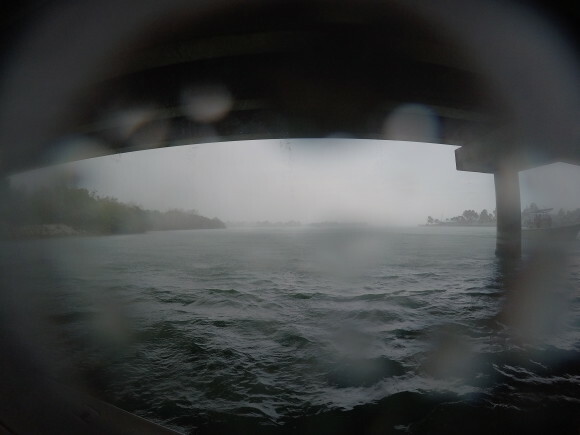 The bottom was stirred up and visibility was sketchy. 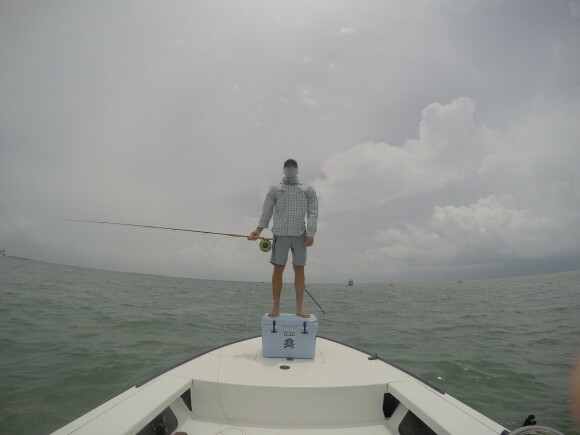 Bill still managed to put us in the path of some tarpon. How he did that… I can only suspect witchcraft of some kind. We actually got a couple of shots, but the fish were so close to the boat by the time we could see them the shots were not high quality. We were watching the weather form out beyond us and when it was clear we were in its way we made a run back toward Vaca Cut. The first squall line had moved beyond us by the time we got there and as we tried to make our way to his slip we ran smack into the second squall line. 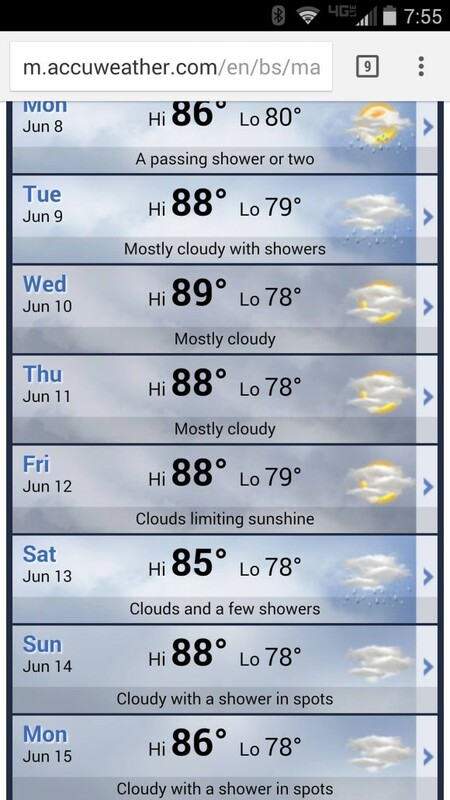 Pretty impressive weather to get stuck in. 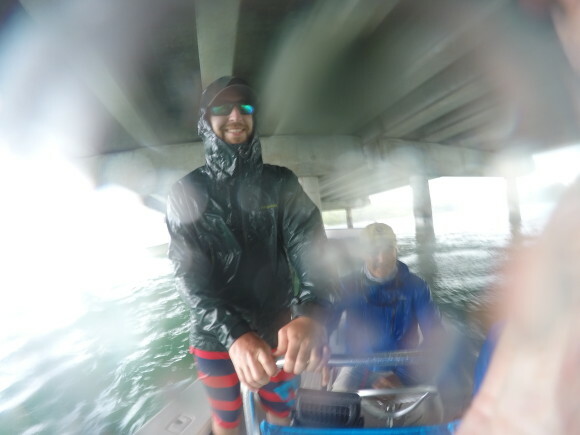 We hid under the bridge and when the storm passed we even got to try for some of the smaller tarpon rolling in the inexplicably placid waters before the wind came back up. 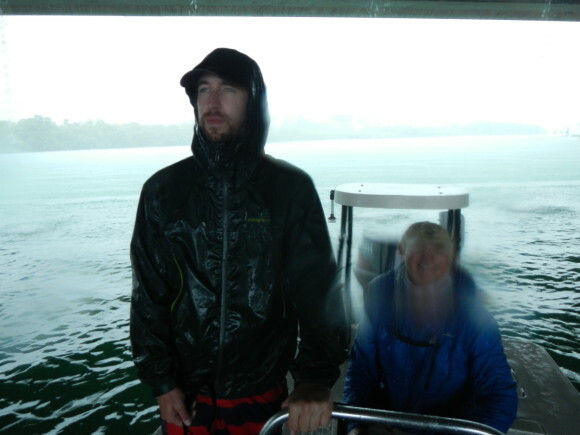 That’s Dan and Bill, under the rain drop. The day was over and I was fish-less again on Day 5. It was a good day though and it was great to share the water with Bill and Dan. I learned a lot from Bill, as I do every time I get on the water with him. Dan… I didn’t learn anything from Dan (kidding), but it was fun to fish with him anyway. 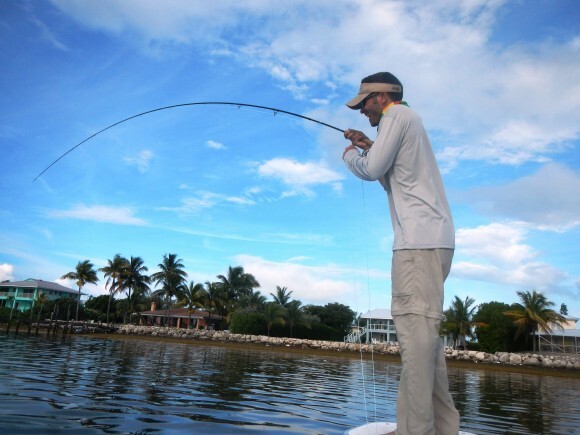 I know tarpon on the fly can be hard. I know there are easier ways to catch tarpon. Float a live crab under one of the bridges and you stand a pretty good shot. That’s not what I wanted to do. That wasn’t what I was there for. It wasn’t what any of us were there for. 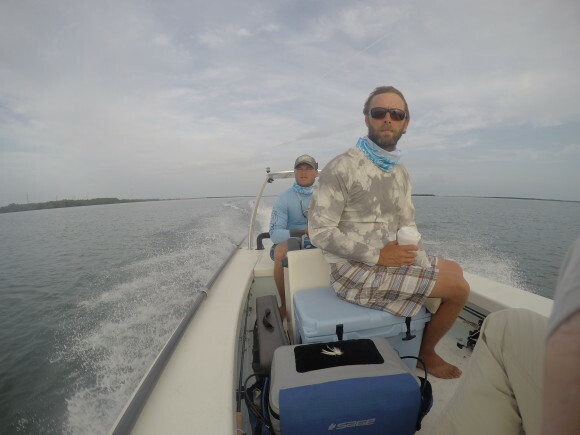 We came from near and far to try to get our own piece of the migrating ocean-side tarpon. I came from California, Matt Smythe from New York, Davin and his dad from the Cayman Islands and we had Ty Lloyd Jr. from the Naples area and Eric Estrada, as close to a local as we had in the group, from Miami. Davin was up in Tavernier with his friend Nate, the rest of us were down in Marathon. The day I got in I got my rental car and headed South. Matt and Ty were already out and not having someone to head out with right away, I did the only thing I could think of and went fishing. 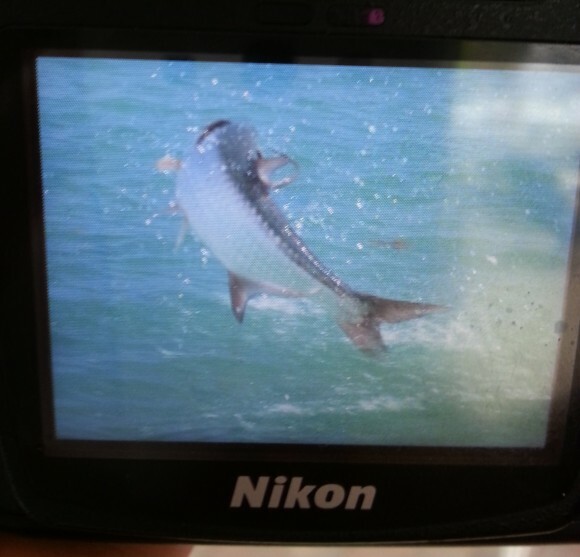 I waded, looking for something roughly bonefish shaped and instead found three somethings tarpon shaped. A wolf pack of three big tarpon came skirting the inside of grass. Sure, I cast at them, just because, but they wanted nothing. It seemed like a good omen. When I got out with Eric later that day, we didn’t see much. The next day with Eric we didn’t see much more. The next day with Ty, we didn’t see much more. We covered water. We staked out. We moved. We made calls. 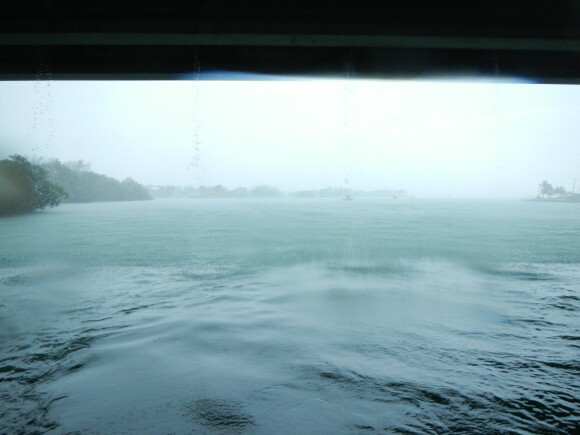 We peered into the water for hours and hours and hours and had nothing to show for it. No one was catching fish, not up in Tav, not in Islamorada, not in Marathon. See, I had been saying these fish have been making this migration for tens (if not hundreds) of thousands of years and they were unlikely to stop any time soon… but they seemed to have kind of stopped. They were running off the script. They were making an idiot out of me/us. The big meat balls weren’t there. 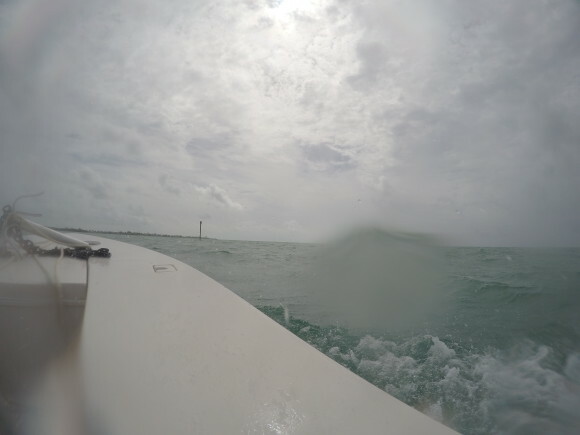 Those rampaging swarms of tarpon, all eyeballs and tails and pushing water visible from a quarter mile… they just weren’t there. We saw a few fish, very few, usually too close to do much about, or, in one case, slightly out of reach. You head all this way and it’s in the window, but there isn’t anything there. Kind of kicks you in the gut. It’s one thing to get shots and miss them, but it is another to just not get the shots. We were counting fish seen, not fish cast at, not fish fed or jumped and certainly not fish released. We went through this a couple years ago, although we saw more fish and there was about 1,000% more rain. From that experience I knew we had to stay positive and, oddly enough everyone did. We slugged it out and there wasn’t much to write about because beyond fishing different places and going out in the back a bit to look for laid up fish, we didn’t see much of anything. We looked for bones and reds on a couple of occasions and every bit of nervous water was a lemon shark. At least there were drinks in the evening and food and friends and good conversations. Stay positive… that’s the trick.